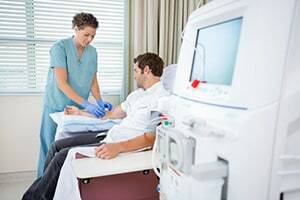 A 35-year-old man presents to Johns Hopkins Hospital for his scheduled kidney dialysis treatment. He normally obtains his dialysis through an arteriovenous fistula (AVF) in his left lower forearm. When he presents for his dialysis, the AVF is clotted and dialysis cannot be performed. He is told to report to the Interventional Radiology Center (IRC) the following day for a dialysis access evaluation. The man presents to the IRC the following day, and the IRC doctors perform procedures on his forearm. These procedures result in closure devices, including wires, catheters, and clamps, being left in the man's forearm. The man is told to return to the hospital for dialysis the next day. When the man presents for dialysis, the closure devices are apparent to the medical staff. There is also a note instructing the medical staff to remove the closure devices before performing dialysis. The Defendant doctors commence the man's dialysis treatment anyway. He is discharged home with the closure devices still in place. In the two days following his dialysis treatment, the man feels extremely fatigued and suffers a severe loss of appetite. After he experiences swelling and bleeding around the closure devices, he reports to the Emergency Department at Johns Hopkins Hospital. The doctors remove the closure devices, but the man's suffering is just beginning. The man remains at Johns Hopkins for 12 days during which time he is subjected to extensive medical testing. It is revealed that his AVF has multiple infections. He is taken to the operating room where he undergoes substantial excision of his left forearm. A catheter is then temporarily inserted to perform his dialysis. The man remains closely monitored in the hospital for several days as his wound dressings are constantly changed and pain medication is constantly administered. The man files a medical negligence lawsuit in Baltimore City. He alleges that the Defendants violated the standard of care by performing dialysis without first removing the closure devices. He contends that reasonable doctors would have familiarized themselves with his condition and realized that proceeding with dialysis, without removing the closure devices, could cause problems. As a result of the Defendants' negligence, the man has been subjected to a plethora of medical complications, testing, surgical procedures, hospitalization, and therapy. Additionally, he can no longer use his left forearm for dialysis. This will lower the quality of treatment he receives in the future and increase the chance that he develops infections. This case was filed without an expert report and was later voluntarily dismissed by Plaintiff. This is no surprise. It does not appear to be a strong case on liability or damages. If you have been harmed by medical negligence, our law firm can help you get the justice and fair compensation you deserve for the losses you have suffered. Miller & Zois has a long history of results, earning large verdicts and settlements in medical malpractice and wrongful death cases. Call today to speak to a caring attorney at 800-553-8082 or get a free, no obligation online case review. What is the most money a victim can get for a Maryland medical malpractice or wrongful death claim? CALL 800-553-8082 or get a free online medical malpractice serious injury and wrongful death claims. Miller & Zois claims throughout the entire state of Maryland.